Makes obtaining colostrum from a difficult ewe or doe less of an "athletic event". 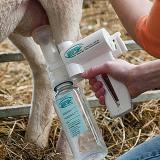 A few pumps creates a seal allowing the teat valve to open and release milk. The flow is not rapid, but effective. 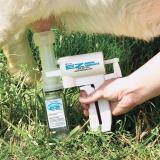 Use for collecting colostrum and milk from ewes & does. Wait up to 30 seconds for the ewe to relax enough to release milk. Once suction has been obtained, "bump" the milker into the udder - similar to the motion a lamb would make if nursing. When suction is obtained - try positioning the milker from various angles (also apply the "bump" concept while doing this). Try a few more squeezes than is advised if milk flow slows. For animals with small teats: The package with rubber inserts (#556111) is needed or you can purchase inserts individually (#556115 or #556116). For goats order quart bottles (#556112). Please read this Product information thoroughly. At EZ Animal Products we are continually listening to our customers and are always trying to upgrade the Udderly EZ Milkers.We have found better Silicone Inserts to go into the #2 (large) extraction tube. The top part of the Silicone Insert is flared at the point where it goes into the top of the hard plastic tube. This virtually eliminates any air leakage from around the top of the tube. (And is easier to assemble) Both the large and small Silicone Inserts fit into the same #2 Tube. (They will not fit into the #1 Tube) We are still including the #1 Tube into each kit because in some instances you may want to use it without an insert. Besides one being bigger than the other, each hard plastic tube is embossed with the number on the front of it. It is still possible to milk most any animal without the inserts but they stop the possibility of any milk/colostrum from getting drawn into the pump. REMEMBER!! Both silicone inserts now fit into only the #2 hard plastic extractor tube. I LOVE my EZ Milker, so ordered a replacement bottle for it. I don't recommend using the bottles as feeding bottles, only for collection. They don't hold up to being frozen or warmed up. Wonderful till the dog ate the tube part that tasted like milk. My fault for setting it on the counter rather than in the sink. I now have the new part but lambing for me is over this year. I will be buying another and parts next year. We used the pump on our lactating ewes. The pump worked very well for a few days, but unfortunately the pump is not sturdy. The plastic parts, mainly the clip holding the bottle and the pump attachement broke very quickly. There has to be a redesign of that clip using a metal part that can lock and not get broken when the ewes fight it a bit. Okay- so I fought this for a long time. I only milk ewes for a supply of colostrum to keep on hand or if the lambs seem weak- I am not using this to make cheese or milk cows. It seems a little pricey for a milker. I can hand milk for free, I even tried a breast pump that I got for $20. I got kicked, upset the ewes, lambs got stepped on and almost always ended with swears and tears. My business partner told me his was a great time saver (he uses one for every ewe in his 30 ewe operation). My husband told me it was worth the price if it saved one lamb. So, before lambing last year I purchased one. I should have purchased one sooner! Once you get the hang of it- it is fantastic. Put it on the teat, pump it just until the milk starts to flow, pump it two more times then hold it so it just hangs on the teat- the milk flows out. If the ewe kicks it off- no spilled milk to cry over- you just pick up the unit and get back to work. I have a few ewes that will just not let down their milk, but do just fine with their lambs (they have milk- it just won't pump out). But in most cases- it works great! I used it a bunch last season and my neighbor borrowed it a bunch too. I just used it on my first ewe this season and it is still working great! I cannot believe I fought it for so long! I am writing this review based on usage of this product for our cow instead of sheep/goats because the pump is the same for all species. We purchased and used two Udderly EZ milkers for our milk cow. We bought two thinking we could use them both at the same time and cut down the time it takes to milk. This did work for a couple months before the problems started. We just kept having parts break. The little rubber valves don't last too long and are expensive to replace. Both our handles broke within a short amount of time. These are also expensive to replace. The bottle clip on one broke, so we went down to using one pump with the working bottle clip. Then, the back part of the pump blew out. It was only connected by flimsy plastic clips and these just wore down and finally snapped off. So I duct taped the back of the pump on and this worked ok. Kept having to replace the duct tape though as it would lose tightness after a few washings. Then it got to the point where I could not tape it on tight enough to create the vacuum. We started using the other pump and the same thing happened to it. Now the whole setup is basically worthless as I am not forking over another $100 to replace the pump. This all happened within 4-6 months. I think these are neat little milkers, but probably should be used more for backup milking if power is out, or colostrum collection only. Their website states these milkers can be used for daily milking, but we have not found this to be the case. We could have bought a small bucket milker for the money we have put into the Udderly EZ. Would not recommend for daily milking. Oddly enough, I was most worried about having to replace bottles. We only lost one bottle during those 4-6 months. The bottles do seem to hold up well but are useless without the rest of the assembly.